The California Lease Termination Letter (30 Days) is a notice that a landlord of a residential premises is to use when asking a tenant to end the lease and leave the property. This form is to be used when the tenant has been residing at the property for less than a year. If the tenant has been residing at the property for more than a year, the landlord needs to provide 60 days notice and should use This Form instead. In California, the landlord has the option of asking a tenant to vacate the premises with 30 days notice only if the tenant has been living there for less than a year. The thinking is that if it is less than a year, the tenant hasn’t really had a chance to establish a home and 30 days is enough notice in that situation. It is also a recognition that perhaps there is a problem with the tenant if the landlord feels the need to terminate early and it gives the landlord an opportunity to change the situation in a relatively short period of time. Step 1 – Download the California Thirty-Day Notice of Termination of Tenancy by clicking on the “PDF” button on the right then saving it to your machine. Step 2 – On the blank line at the top of the page, document the Full Name of each Tenant and Sub-Tenant whose Tenancy will be terminated thirty days after receipt of this Notice. Step 3 – Locate the words “of the premises located at,” then enter the Street Address of the Rental Property the Tenants (named in Step 1) must vacate and surrender to the Landlord. If there is a Suite Number or Unit Number, you may report this on the blank space labeled “Unit # (if applicable).” The next line will contain two blank spaces: “City” and “Zip.” Report this Address’ respective City and Zip Code on their respective blank spaces. 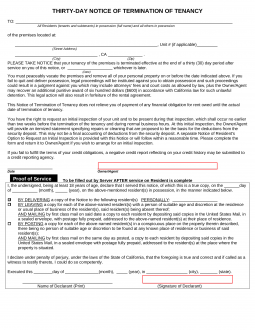 Step 4 – On the blank line labeled “Date,” in the paragraph beginning with “Please Take Notice,” report the estimated Date that is Thirty Days from the Tenant’s receipt of this Notice. Step 5 – The next few paragraphs are a disclosure of information and conditions aimed at the Tenant, make sure you have read this as well. At the end of these paragraphs, the Owner or Agent issuing this Notice must provide an official Date for this form on the blank line labeled “Date” then, his or her Signature on the blank line labeled “Owner/Agent”). Step 6 – The individual serving this Notice to the Tenant(s) must verify the Date the Tenant has received this document. This will be done in the “Proof of Service” section. The server of this Notice must locate the first blank space in this paragraph then report the Calendar Date the Notice was delivered to the Tenant. On the second blank space, the server must report the Month this Notice was successfully delivered. Then, on the third blank space, report the Year this Notice was successfully delivered to the Tenant. Step 7 – The next fact the Server of this Notice must report is how this paperwork was delivered to the Tenant. Note: This section may only be completed after the Tenant has been served. If the Server delivered this Notice by personally giving the document to the Tenants, then mark the first box and enter the Name of the individual the Notice was served to. If the Server had to leave the Notice (at the place of residence or business) with a reliable individual who will deliver it to the Tenant then, mark the second box. Note: If this document has been delivered in this manner then it must also be Mailed to each Tenant being addressed. If this Notice was Posted in a conspicuous place (such as posting it on the door of the Property) then, mark the third box. This paperwork must be mailed to each Tenant being addressed the same day it is posted. Step 8 – The bottom of this form will contain a verification statement that must be Signed and Dated by the Server. There will be several blank spaces after the words “Executed this…” at the bottom of the page. On the first blank space, report the Calendar Day of the Month the method of delivery (indicated in Step 6) was successfully completed. On the second blank space, report the Month this method of delivery was completed. Then on the third space, report the year. Step 9 – After reporting the Date of Delivery, locate the blank space following the word “…in,” then report the City where this method of deliver occurred. Finally, report the State where the method of delivery was completed on the last blank space of the verification statement. Step 10 – Locate the first blank space on the last line of this document, labeled “Name of Declarant…” The individual who has successfully delivered this Notice to the Tenant(s) named must Print his or her Name here. Then on the second blank space (“Signature of Declarant”), the Server of this Notice must Sign his or her Name on the blank line. Step 11 – Serve this Notice to the Tenant in one of the manners defined in Step 6. Once, this is done, complete the reporting requirements in Step 6.